Today, aside from being my studio day, is Spirit Day. I need to hunt my wardrobe and see if I have something purple - I certainly used to have purple clothing but I'm not sure if I do any more. 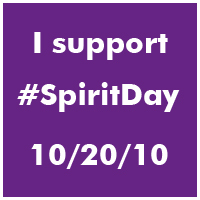 For those who don't know about Spirit Day, it is a day that was established to honor those teenagers who recently committed suicide because of their inability to deal with or to get support for their Lesbian, Gay, Bisexual or Transexual preferences. In several cases they were bullied by their peers to the point that suicide seemed the best option. Suicide is not a solution, but it seemed to be the only way out for these children. Wearing purpoe today is also a way to show support for the hundreds of thousands of LGBT people, especially those who are facing the same pressure and bullying from others. The color Purple symbolizes "spirit" on the rainbow flag that is used for LGBT Pride. There is no rally, there is no meeting, just wear purple to show your support. Show your support by wearing purple today! Today is my studio day and I have a list of "to do's" that is as long as my arm. I only have three Wednesdays left to finish the arrangements for Chickie's party. I have to do the seating chart and signage, the storyboard, the chair cover and the rest of the decorations. I need to visit the restaurant again today to finalize the numbers and the schedule, and then I also need to do my own work. I have six boxes ready to strip for refinishing. Since the stripping solution is really noxious, I can't do that during the winter - it needs to be done outside. I have to grab the last few nice days of summer before my snow falls and my temps are too low to do this. Well, I've got to get moving - I have a lot to do today :-) Have a great day! The day is over by now over here, but I wore the most purpley thing I have, a striped shirt, purple and white. I don't think I saw many people in purple in the office, I have the feeling Spirit Day may have been bigger in the US. One of the teens who committed suicide was from my northern suburbs - quite close. Thanks for your support, I am a strong believer in individual choice and think that, for a first year, it got good press. Now if we can just keep the momentum going.